Woah. I just checked my numbers of subscribers to this blog and it jumped up sometime over the past week or so. There apparently more of you out there reading what I have to say on a regular basis. I really AM honored. And floored. I'd like to share a treat with the new readers OR those out there who might want to consider subscribing to my feed right now. If you subscribed sometime within the last few days (and do be honest please) OR if you decide you want to subscribe right now, leave a comment. Make sure to let me know if you just subscribed recently and/or if you decided to do so when you left the comment. In other words, subscribe and enter yourself into the contest. The Blue Castle by Lucy Maud Montgomery. My FAVORITE book in all the world is Anne of Green Gables. When I started my photography business (before I was married) I thought my friends would think me too cheesy if I named it after Anne. So I tried to be more subtle in my love for Montgomery and I chose to name my business Blue Castle Photography. (Thankfully my husband approved and now we run the business together as a couple.) Blue Castle Photography is also now the primary means of funding our adoption from South Korea. In other words, this particular book by Montgomery has become significant in my life. More so than I ever thought it would be. And now I'd like to share it with one of my new readers. Just for kicks - I'll give you a second change at winning if you subscribe to our adoption blog, Images of Hope. If you do that, just leave two comments below saying you subscribed to both this blog and Images of Hope. 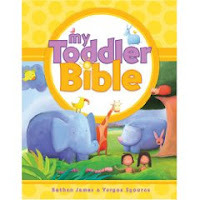 The other book you can choose, if you are the winner, is My Toddler Bible. In September I reviewed a number of children's Bibles from Tyndale Publishers. You can read the reviews here at 5 Minutes for Books or right here at Reading to Know. 3. Subscribe right now to this book blog (and get an extra entry if you subscribe to Images of Hope also). This contest will remain open for one week. It will close Sunday, October 12th at midnight and I will announce and contact the winner on Monday, October 13th. P.S. I just put up the "Subscribed to" button on the top right hand corner of this blog. Guess that would have been helpful, eh? Carrie, I just subscribed in the past few days but I already have both these books :) so I'm not in the running. But I had to chime in - I love LM Montgomery, Anne of Green Gables and Emily of New Moon are on my top favorites list, but I hardly ever see anyone mention the Blue Castle. It's another one of my favorite Montgomery books, with its grown-up theme of love but within a Cinderella setting. It's lovely that you named your business after it! I'm a subscriber and would love to win The Blue Castle! One I don't have and haven't read, for shame! I've had the Anne craze since I was a teen and created the email address ladyufshalott. ;-) And now my blog is called "A Kindred Spirit's Thoughts" - just can't seem to stay away from it! lol Thanks for the giveaway! Well Carrie I don't know how to subscribe to you blog---looked and couldn't find, but if you show me, I will. I come read your blog every day and enjoy it a great deal! Anne of Green Gables is one of my fav's too. I have not read The Blue Castle though---but it sounds good.